This view shows the fountain and pond designed by William Webster as part of Letchworth's Ornamental Farm. A wooden bridge crosses over one end of the pond. The label of this view is interesting. 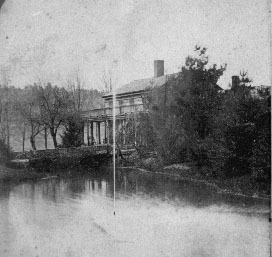 There is no explanation for the "Catlin House", a name which appears on this same image on two other mounts. Was it a name that Smith tried for his old temperance tavern or a mistake by the photographer? See The Story of the Glen Iris for more information.